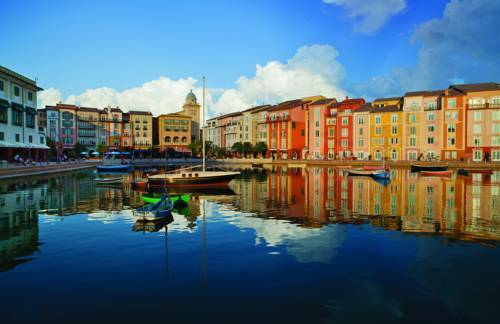 Stay On-site at Loews Portofino Bay Hotel and Experience la dolce vita the sweet life at this AAA Four Diamond Award winning hotel located within easy walking distance of both Universal Studios and Universals Islands of Adventure theme parks. On-site hotel guests SKIP THE REGULAR LINES in both Universal Orlando theme parks - A FREE BENEFIT WORTH UP TO 89 DOLLARS PER PERSON, PER DAY Plus enjoy EARLY PARK ADMISSION to the Wizarding World of Harry Potter, one hour before the park opens. Valid theme park admission required. Restrictions Apply. Guests will also enjoy Complimentary resort-wide transportation, including water taxis connecting the hotels and theme parks, priority seating at select restaurants throughout the resort, complimentary package delivery to guest rooms and resort-wide charging privileges with your hotel room key card. Hotel rooms can accommodate up to five people per room - roll away required for the 5th person (fees apply). Pet Friendly rooms are available (fees apply). Universal Orlando Resort - Orlando, FL, 32819. Located within easy walking distance of Universal Studios, Universal's Islands of Adventure, CityWalk entertainment complex, Loews Royal Pacific Resort and Hard Rock Hotel at Universal Orlando! The cancellation policy for Central Reservations will be a deposit equal first night's room and tax if reservation is canceled within 5 days of arrival. Deposits are charged within 5-7 business days. The Thirsty Fish is a friendly Italian wine bar serving savory cicchetti - small plates of food. Its harborside location on the piazza is perfect for viewing the sunset while you sip Peroni or a glass of wine, smoke a cigar, or enjoy a cordial with family or friends.